Maritza Martinez Mejia is the recipient of the Crystal Apple Award 2006 and F.A.U Poetry Contest 2010. She lives in Florida with her husband and their two teenagers. Maritza published three bilingual books: "Vanilla and Chocolate, "Grandma's Treasure, "Poems, Thoughts and More," and her memoir "Hazel Eyes" to inspire others. 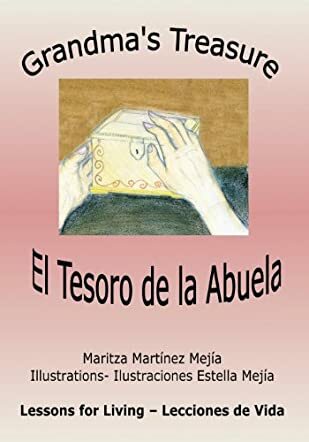 Grandma's Treasure: El Tesoro de la Abuela by Maritza Martinez Mejia is a charming and adorable bilingual book that conveys a beautiful message to young readers. Grandma slowly leaves the breakfast table one morning and is sitting in the attic in her old wooden chair, looking sad and holding a chest, while a brother and sister are fighting over their toys. Grandma then shares her childhood memories, which are locked inside the chest, with her two grandkids. She describes her memories as three treasures, and then she opens the chest to show the kids. What are the three treasures that she shares with them? It's a beautiful story that connects the kids with their grandma's childhood. The plot is original and it touches the hearts of readers. The pictures are bright and colorful and breathe life into the story, characters and scenes. It makes an excellent bedtime storybook for young readers and is also good to use for read aloud sessions in classrooms. The story conveys a lovely message of how in olden times people were contented and happy with whatever they had, and how now kids with a truckload of toys still fight with each other and throw the toys around. Stories that convey messages or have concepts or an educational theme are helpful to make children understand things in an easy way. This book not only evokes nostalgia among older readers, but also teaches young readers to appreciate what they have and be contented in life. I'm honored to receive Grandma's Treasure wonderful review. Thank you!